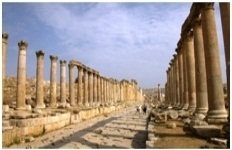 Discover the culture of Jordan through one or more of our tours. Designed to highlight some of Jordan's most renowned destinations, as well as introduce our guests to the uniqueness of our land, these day tours encompass the Arab experience for a variety of styles and tastes. Available directly from our branch office at Golden Tulip Hotel, a visit to Jordan has never been easier. 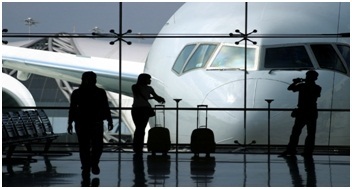 Visa Requirements: The cost of entry visa for all nationalities is 20 JD (approximately $30) and can be easily obtained at Queen Alia International Airport Or contact our Branch office at Golden tulip hotel – Airport for Assistance. Amman, the capital of Jordan, is a fascinating city of contrasts, a unique blend of old and new, ideally situated on a hilly area between the desert and the fertile Jordan Valley. In the commercial heart of the city, ultra-modern buildings, hotels, restaurants, art galleries and boutiques rub shoulders comfortably with traditional coffee shops and artisans’ workshops. There is evidence of the city’s much older past everywhere you turn. 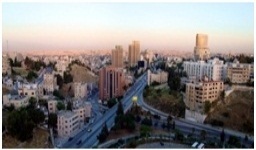 Due to the city’s modern-day prosperity and temperate climate, almost half of Jordan’s population is concentrated in the Amman area. The residential suburbs consist of mainly tree-lined streets and avenues flanked by elegant, almost uniformly white houses. The downtown area is much older and more traditional with smaller businesses producing and selling everything from intricate gold and silver jewellery to everyday household items. The city offers its visitors plenty of lively nightlife, with everything from cultural and theatrical events to traditional Arabic entertainment, modern restaurants and clubs. No more than a four hour drive from anywhere in the country, Amman is also a perfect base for delving deep into Jordan and the various landscapes it provides. Jordan is renowned as a shopping destination and presents a lively blend of modern and traditional items; Browsing through souqs as well as big malls in Jordan can be a lot of fun and may turn into something of a social occasion. In small shops particularly, it is not unusual to be offered a cup of coffee or tea before getting down to business. The souq is one of the remaining places where the tradition of bargaining or haggling over the price is still observed, so practice your negotiation skills and pick up a bargain! Shopping hours are flexible; some shops are open from 09:30- 13:30 and 15:30 -18:00. Others may be open longer, from 08:00 -20:00. Many shops close on Friday, but the Souq does not close. Madaba’s extensive archaeological park and museum complex encompasses the remains of several Byzantine churches, including the outstanding mosaics of the Church of the Virgin and the Hyppolytus Hall, part of a 6th century mansion. Mount Nebo it is the place where Moses was buried and the most revered holy site in Jordan. When atop this mountain, one can see, as Moses did, the vast panorama that encompasses the Jordan River Valley, the Dead Sea, Jericho, and Jerusalem, often referred to as the Holy Land. Mount Nebo’s first church was built in the late 4th century to mark the site of Moses’ death. It remains a place of pilgrimage for Christians. The Dead Sea has an historical and spiritual legacy of its own. Today, its eastern shore is sparsely populated and serenely quiet. With much of the landscape virtually unchanged since ancient times, this is a favorites spot for a holiday drive. Spend the day sunbathing, swimming, or dining. Relax in the gently lapping waters and be amazed that you can’t sink! Treat yourself to a soothing massage, or try the well known healing powers of minerals from the sea’s muddy floor. If you’d like a more leisurely stay, spend the night at a comfortable hotel that looks across the sea to the western banks. This west-facing view affords visitors to the Dead Sea the unique treat of its spectacular sunsets. A close second to Petra on the list of favorite destinations in Jordan is the ancient city of Jerash. It boasts an unbroken chain of human occupation dating back more than 6,500 years. The city’s golden age came under Roman rule and the site is now generally acknowledged to be one of the best preserved Roman provincial towns in the world. Hidden for centuries in sand before being excavated and restored over the past 70 years, Jerash reveals a fine example of the grand, formal, provincial Roman urbanism that is found throughout the Middle East, comprising paved and colonnaded streets, soaring hilltop temples, handsome, theatres, spacious public squares and plazas, baths, fountains and city walls pierced by towers and gates. The Jordan Valley has profound meaning for religious travelers. The area opposite Jericho has been identified for nearly two millennia as the area where Jesus Christ was baptized by John The Baptist, Stunning archaeological discoveries between the Jordan River and Tall Al-Kharrar since 1996 have identified this area as the biblical “Bethany Beyond the Jordan,” where John was Living when he baptized Jesus, Two thousand years later, people from all over the world still come to this site to be baptized. The late Pope John Paul II also visited the site as part of his spiritual pilgrimage to the Holy Land at the start of the new millennium. Tall Al-Kharrar (St. Elijah’s Hill), is reminiscent of the Prophet Elijah. It is from this hill that he ascended to heaven in a chariot of fire. St. Elijah’s Hill is now the focal point of the Baptism Site and is covered with the remains of a Byzantine monastery with churches, large baptism pools and a water storage system. Findings from the early 1st century AD confirm the site was inhabited during the lives of Jesus and John the Baptist. A 3rd century building with a white mosaic pavement has been called an early Christian “prayer hall,” this may be one of the earliest Christian prayer facilities identified anywhere in the world. Also identified on St. Elijah’s Hill is the cave where, according to numerous Byzantine pilgrims’ texts, John the Baptist lived and baptized Jesus Christ. The Byzantine church built around the cave and man-made water channels emerging from the cave have been excavated in the last few years and can now be visited. Closer to the Jordan River are four other Byzantine churches and large pools with an extensive water system. These facilities were mentioned in texts by Byzantine writers, who linked them with the tradition of Jesus’ baptism. 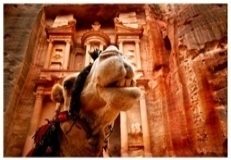 A world wonder, Petra is without a doubt Jordan’s most valuable treasure and the greatest tourist attraction. It is a vast, unique city, carved into the sheer rock face by the Nabataeans, an industrious Arab civilization who settled here more than 2000 years ago, turning it into an important junction for the silk, spice and other trade routes that linked China, India, and Southern Arabia with Egypt, Syria, Greece, and Rome. The Nabataean Kingdom existed for centuries, and Petra became widely admired for its refined culture, massive architecture and ingenious complex of dams and water channels. Ultimately, however, the Roman Emperor Trajan annexed the Kingdom. By the 14th century, Petra was completely lost to the West, and so it remained for almost 300 years. Then in 1812, a Swiss traveler, Johann Ludwig Burckhardt, persuaded his guide to take him to the site of the rumored lost city. Secretly making notes and sketches, he wrote: “It seems very probable that the ruins at Wadi Musa are those of the ancient Petra.” In order to preserve Petra, now a UNESCO World Heritage Site, all tourist facilities have been located in the town of Wadi Musa, next to the entrance of the site. Jordanian culture at its most.